A modern vegetarian cookbook packed with quick, healthy and fresh recipes, that fits perfectly with how we want to eat now. How we want to eat is changing. More and more people want to cook without meat a couple of nights a week, or are looking for interesting ideas for dishes for their vegetarian friends (whilst pushing their own vegetarian repertoire beyond a red onion and goat's cheese tart or a mushroom risotto). At the same time we want to eat food that is a little lighter, a little healthier, a little easier on our pockets, but that won't have us chopping mountains of veg or slaving over the stove for hours. 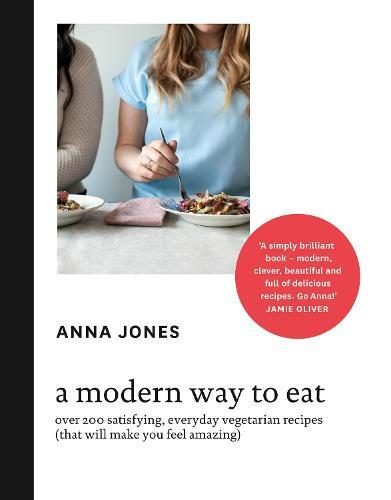 Anna Jones is a brilliant young cook and food writer, who worked with Jamie Oliver for many years. Her first cookbook is a totally modern take on vegetarian eating - recipes that are healthy, nourishing, truly tasty and satisfying, introducing new dishes that are simple to make. Based on how Anna likes to eat day to day, A Modern Way to Eat covers everything from a blueberry and amaranth porridge to start the day to a quick autumn root panzanella or avocado, butterbean and miso salad for lunch; a tomato and coconut cassoulet, pistachio and squash galette, or mint, ricotta and courgette polpette for dinner. Packed with recipes that explore the full breadth of vegetarian ingredients - different grains, nuts, seeds and seasonal vegetables - and alternative approaches to cooking that avoid too much dairy or heavy carbs and gluten, this is a cookbook for how we want to eat now. Billed as ‘the new Nigella’ Anna Jones turned to cookery, having quit her office job to pursue her passion for food. She earned a place on the training programme at Jamie Oliver’s Fifteen in London and subsequently worked in some of London’s top restaurants. After working as a chef and food stylist around the world, Anna turned to writing her own recipes, centred around the idea of delicious, healthy and inspiring vegetarian food. Her cookery books are A Modern Way to Eat, A Modern Way to Cook, and The Modern Cook’s Year.